Label: Guided By Voices Inc. Original Release Info for 100 Dougs & Wine Cork Stonehenge: After 2018's critically acclaimed Space Gun LP and a string of jaw-dropping, sold-out shows, GUIDED BY VOICES has announced a sprawling double-album, Zeppelin Over China. to be released on February 1. But before this one has even made it to the warehouse, Robert Pollard has written and recorded another full-length in record-breaking time. It's Warp and Woof (April 2019), exuberantly barreling through 24 songs in just 37 minutes with a brevity similar to mid-90s GBV albums Alien Lanes and Vampire On Titus. GBV kicked this one out in a flash, recorded in studios, club soundchecks, hotel rooms and even in the tour van. And because you can never have too much GBV, the album is being teased on four vinyl-only (1000 copies) limited edition 7-inch EPs: Winecork Stonehenge and 100 Dougs will be released in November. 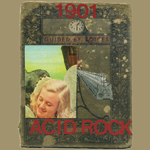 Umlaut Over The �zone and 1901 Acid Rock in March. 6-song EP mentioned by Bob in note posted to GuidedByVoices.com on July 11th, 2018. EP to be released in May 2019 after the Zeppelin Over China GBV double album along with another 6-song EP called Umlaut Over The Ozone.